Northern Poland adventure, 2018 - 2019 tours to Poland - discover exciting Poland with us! Breakfast. Next, half-day guided tour of Warsaw including all of the most important places in Polish capital: the Old Town with the Royal Castle, The Royal Route and Łazienki – the Royal Park. You will see also places like the former Jewish ghetto, the Monument to the Warsaw Uprising of 1944. Later that afternoon time to relax, private walks or gift shopping. An overnight stay at a hotel. Breakfast. Transfer to the Warsaw train station with our driver service. Departure by express - intercity train to Gdansk, where you come after 3 h ride. Our guide-driver welcomes you at the Gdansk station and transfer to your centrally located hotel. Check-in and your afternoon tour of the Gdansk Old Town, including visit to places like Golden Gateway, Neptunes Fountain, the Artus Court, the Uphagen House and Dluga Street. Moreover Mariacka Street with St. Mary cathedral, the wooden Crane on the River Motlava, and a stroll around the yacht harbor. Alternative dinner in one of the famous Fisherman restaurants, serving local food and fresh fishes. An overnight stay at a hotel in Gdansk. Breakfast and a whole day tour to Malbork - the city is on the UNESCO list for having one of the worlds most unique monuments: Malbork Castle - the former residence of the Grand Master of Teutonic Knights - it also contains Polands largest collection of amber. Castle tour with local guide. 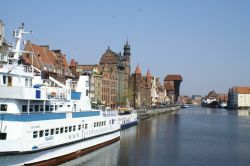 Next, transfer to Gdańsk, time for afternoon walks and relaxation. An overnight at hotel in Gdansk. Breakfast and whole day dedicated to the Tri-City (Gdansk-Gdynia-Sopot) attractions. Your guided tour with visits to the Solidarity Monument at Gdansk Shipyard, a birthplace of the Solidarity movement , an organ music concert in the Oliva Dome. Afternoon visit to Sopot - a lively seaside resort popular for relaxation, famous for the longest wooden pier in Europe. Return to Gdansk, time for private walks at the Old Town area, with possible amber shopping. An overnight stay at a hotel. Breakfast and transfer by our driver to the Gdansk station. Departure by a direct train to Torun, where you will come after 3 h ride by a direct train. Our guide welcomes you at the station. Transfer to centrally located hotel for check-in. Next, an afternoon half-day tour of Torun Old Town, with visit to the Museum of Nicolas Copernicus, the Town Hall, St. Marys and St. Johns Church and the Crooked Tower. You will have also an opportunity to taste famous Torun Gingerbread. Evening time to relax, an overnight stay at hotel in Torun. Breakfast and transfer by our driver to the Torun station, and departure by a direct train to Warsaw, where you come by midday time. Your tour ends or one extra night at Warsaw hotel on your request. - USD 1130 pp - USD 1070 pp now ! - USD 1240 pp USD 1180 pp now ! with accommodation at 4* hotels: Polonia Palace**** in Warsaw, Admirał**** in Gdańsk, and Bulwar**** in Toruń. Other tour dates and price: on your private request. Tours on request in 2019 available with a price from USD 1230 per person at 3* hotels. It’s night life you’ re looking for! Sopot called the ‘Pearl of Baltic’, is the most popular spa of the Polish east coast which is yearly visited by many holidaymakers and tourists. It's a picturesquely situated resort at the foot of the Try-city Hills on the Gdańsk Bay and is marked by one of the longest pier. Sopot is known for its International Song Festival and a great number of sports and cultural events. It's nightlife you're looking for and not to mention shops, cafes and a cracking seaside location. Sopot- famous seaside resort, popular with celebrities, the most stylish beach resort, on the whole of Baltic Coast, combines its great traditions with an interesting cultural and recreational program. The wooden pier built in mid-19th century is 512 metres long, which makes it the longest in Europe. It is also a favourite promenade. Malbork with its extensive Gothic castle complex. The Grand Master of the Teutonic Knights once lived in this fortress. “Light and sound” spectacles are held here as well as knights' tournaments for those who find looking at museum collections is not enough, also a conference center.